This is the 365th image in the project, and should be the last, but because 2012 is a leap-year there’s one more to come. Over the last year I have taken you on a journey into my mind and throughout my “hood.” We have been by the sea and beside tranquil, remote lakes. We’ve seen junkyards and lighthouses; fishing boats and mill wheels; sea gulls and rare woodpeckers; grape tendrils and trees; flowers and weeds. What you haven’t seen… is me, so for my second last image, here I am, hard at work, focusing on a point of land on my own property. Stay tuned for the spectacular ending tomorrow! Sony A-900 – Sigma 24-70mm – f 2.8 – 24mm – ISO 320 – f22 – 1/90. 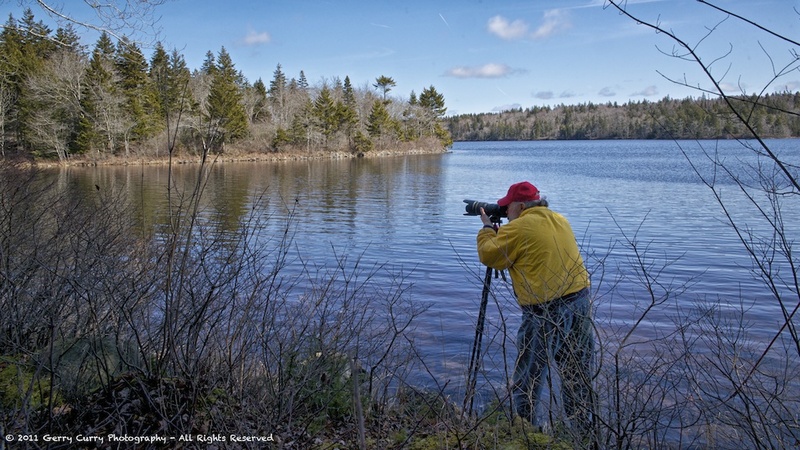 This entry was posted in Lakes, Landscapes, People, Portrait, Spring, Trees, Woodlot and tagged Lakes, landscape, nova scotia, People, Self-portrait, Trees, water, Woodlot, Yarmouth county. Bookmark the permalink. Gerry, so sorry to hear that that this blog & daily pictures are about to end. I have enjoyed your journey over the last year in your pictures & your descriptions. Thanks so much for sharing. I do hope you are leaving it up as I go back from time to time to look at your pics.